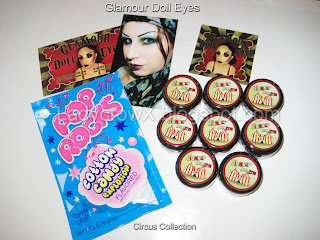 Glamour Doll Eyes has announced the release date for their Circus Collection! This collection will release on Tuesday, November 15th. There are 7 eye shadows and 1 eye light in this collection. 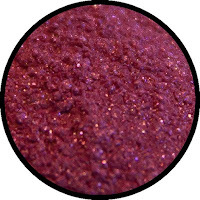 6 of the shadows are brand new (ALL unique to GDE) and 1 is a repeat (Oddity, which has been Natasha's color for a while now). This collection WILL BE permanent and they will be sold in sample sizes as well as full sizes. The sample jar and full jar collections will come with a box. This is new to GDE; we have never packaged anything in a box before. This is just truly special to any other collection we have released. Each shadow also has a special circus themed label on top! It will also come with a special circus themed business card, sticker and a circus themed treat. I did a post on this for swatches you can check out out here. Along with this set, 2 other colors will be released: Grenade and Candy Floss. I can say I definitely LOVE this collection! I'll be doing a video tutorial look later today with some of the colors! Wow! Looks like an amazing collection- especially Fiji Mermaid & Fire Eater. I have to admit, I have a ton of pigments that I pretty much never use, so I really don't *need* these, but, boy am I tempted!